After placing 2nd at the Wingate and Petrides Tournaments, Madison made the jump to the top of the podium at the Canarsie Freeze. Individual champions Feruz Telmanov, Howie Wang, and George Grigalashvili led the team to a first place finish. Also placing for the Golden Knights were Dean Blafford, William Harris, Nikita Ignatenko, and Elvin Guliev at 2nd place. Capturing 3rd place medals were Daler Ergashov, and Michael Khalabudnyak. At the Petrides Duals the weekend before, Madison placed 2nd with wins over New Dorp, Susan Wagner, Flushing, and Metropolitan Campus. 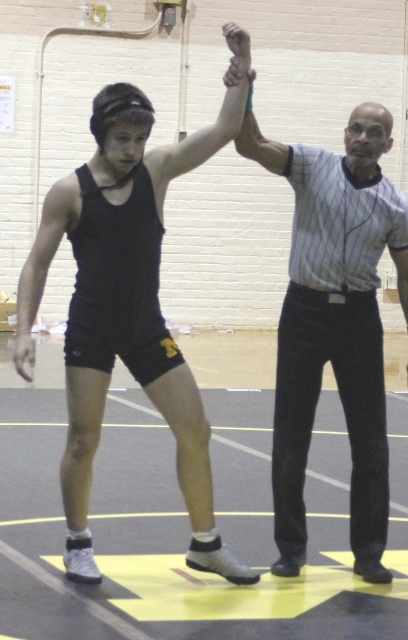 With their division title secured with a win over the Murrow Magic, Madison wrestling will once again wrestle in the PSAL Team Playoffs scheduled for Saturday, January 30th at Jamaica High School. The team is currently 14-3 and will wrestle their final match of the regular season at home against Sheepshead Bay on Thursday, January 21st. 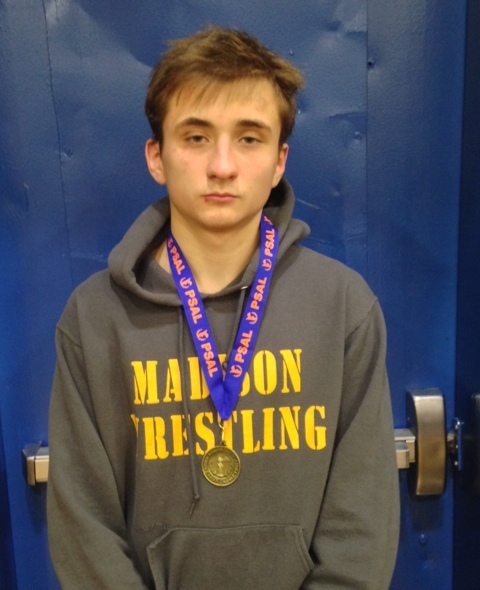 Led by senior Angel Tapia and junior Nikita Ignatenko, who both placed first at 160 and 138 pounds respectively; the Madison wrestlers earned a 2nd place finish at the Wingate Winter Wrestling Tournament. William Harris (132), Howie Wang (152), and George Grigalashvil (220) placed 2nd, while lightweights Dean Blafford (113), Timmy Turakulov (106), and Feruz Telmanov (99) battled back from early losses to earn a 3rd place finish. Madison finished the tournament in a tie with Midwood for second place. Brooklyn Tech won the tournament. Madison has a 5-2 overall record and will travel to take on divisional rival Lafayette on Tuesday the 22nd. To ring in the new year, the team will travel to the Petrides Duals on Staten Island, January 9th. The quest for a championship will begin in earnest this week as the Madison High School Wrestling Club gets back to work on the mats. The team’s first “on the mats” session is Tuesday, September 29th. The team will be on the mats every Tuesday at Madison until October 27th. There will also be Thursday mat sessions at Cunningham Middle School with Coach Santimauro until October 29th. Training starts at 5:30 PM. 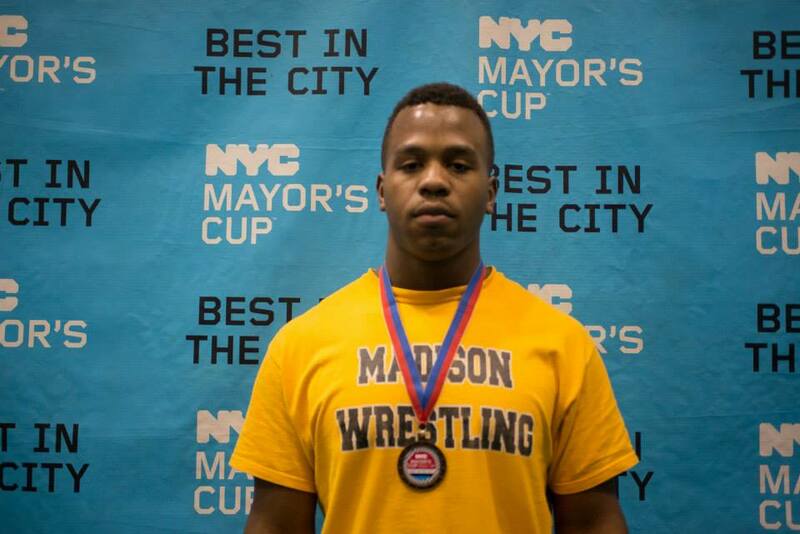 Madison wrestling ended the 2015 season with a 13 and 4 overall record, and earned a top 10 finish at both the NYC Mayors Cup and PSAL Individual Championships. The team has an eight year streak of posting a winning record, making the playoffs, and advancing to at least the “Elite Eight” of the PSAL Team Championships. The team had three wrestlers last season with over 20 wins. The team placed 8th overall at the PSAL Individual Championships and State Qualifier, where Albi Miraka, and Brandon Santiago both won championships. Without these forms completed ahead of time, the new wrestler cannot practice. If you have any questions or concerns, please feel free to contact me. You can email me: coachcampellscorner@hotmail.com, or reach out on facebook to Campbells Corner. The Golden Knights had a strong week which included large margin divisional wins over near-by Goldstein (57-2l) and Sheepshead Bay (73-6) high schools. 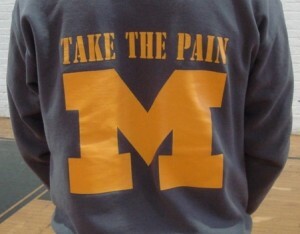 Madison Wrestling is now 7-0 in their division and 9-2 overall. The Knights would add to their mid-week success by placing 4th overall at the Brooklyn Tech Invitational tournament. Nine Knights would take the mat at the tournament which held huge implications for the PSAL Individual City Championship. Among the competing schools were some of the city’s best teams, Grand Street Campus, Tottenville and the returning PSAL champion Brooklyn Tech. Several notable ranked wrestlers would compete in the tournament from the above schools as well as from Midwood, Brooklyn International and Wingate to name a few. 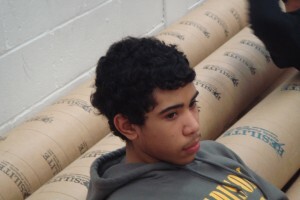 The Madison Knights would have five wrestlers qualify for the medal rounds and finish a perfect 5 for 5 in those rounds. Brandon Santiago (126), Mirlan Jumabaev (170), and Albi Miraka (285) would earn gold while Angel Tapia (152) and George Grigalashvili would both get their hand raised for the bronze medal. Brandon Santiago would dominate his weight class, posting a pin fall over Brooklyn Tech’s Ishara St. Phard, a Major decision over Midwood’s Colin Dowd, and a 7-2 victory over Jonas Marrello of the tournament’s only Long Island team – Center Moriches. 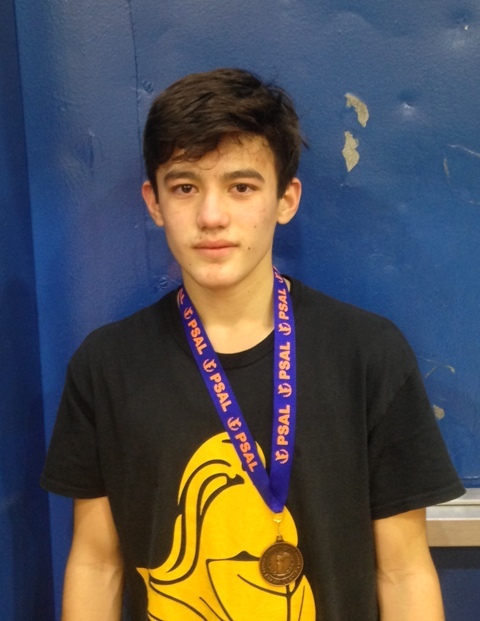 Mirlan Jumabaev’s path to gold saw its toughest trial in the semi-finals against Center Moriches’ Joe Adams. The Madison 170 pounder would prevail in a 10-7 decision. Jumabaev’s final match ended with a foot sweep to the pin-fall over Robert Wagner high school’s Robert Delgaso. Starting the day in the semi-finals, Albi Miraka would wait for hours before securing a 3-2 come from behind victory over Tottenville’s David Roman. The win would send Madison’s big man into the finals where he would earn an injury default victory over Grand Street’s Jacob Jones. Following a first round loss, Madison’s 152 pounder, Angel Tapia, would battle back in the consolation bracket to earn his second 3rd place finish in as many tournaments. His consolation matches included a pin fall over Tech’s Chris Panagakos and a major decision against Tottenville’s Michael Obrian in which Tapia scored a flurry of takedowns. Tapia would finish the day with a pin fall over Robert Wagner’s Bryan Serrano. George Grigalashvili would begin the day with a pin fall over Tottenville’s Dabrowski before losing to Wingate’s eventual champion, Judens Claude. Dropping down to the consolation semi-finals, the Madison freshman would pin Grand Street’s Odean Gray & Xaverian’s Carrol in order to finish in 3rd. While he didn’t place in this tournament, an honorable mention is deserving for team captain Howard Wang. Starting the day with a tough 7-8 loss to Grand Street’s Demitreus Henry, the 132 pounder would win the next two. Wang’s consolation bouts would include an 11-4 victory over Center Moriches’ Tim Delgado and a 10-3 victory over Murrow’s Horace Trim. Howard’s day would end in the consolation semi-finals when he lost to Baruch stand-out Jean Marti. 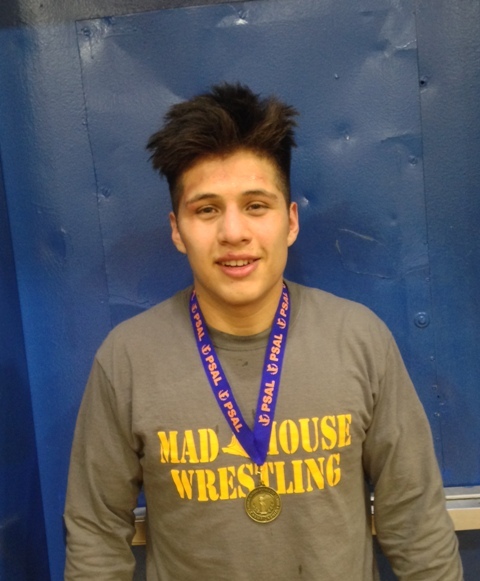 Each Madison wrestler won at least one match at the Tech Invitational. Those wins would prove essential to Madison’s 4th place finish at the tournament (a mere 7 points behind 3rd place Brooklyn Tech). Madison’s next competition will be on the road on Tuesday, January 20th when they face rival Midwood. The “Battle for Bedford” will determine the division’s winner as both teams will enter the day undefeated. January 22nd will be the PSAL season finale vs. 6-1 New Utrecht at home. 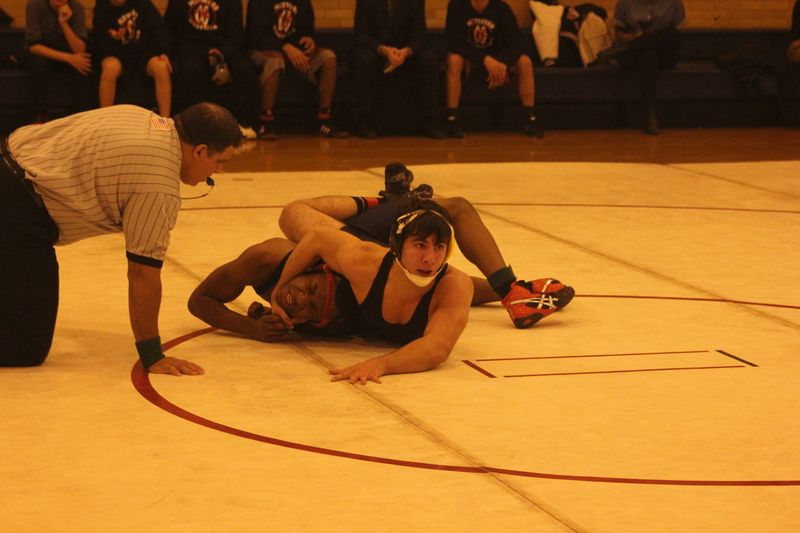 On Saturday the 24th, Madison will travel back down Bedford for the Midwood Duals. It will be a dual meet competition including host Midwood, Brooklyn Tech, Edward R. Murrow, Bronx Science, and Staten Island’s Curtis high school. Madison Wrestling started off the new year at the Ironman Tournament at Monsignor Farrell. 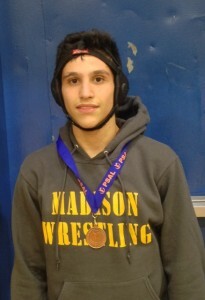 Nine wrestlers competed, with Brandon Santiago taking 1st place at 126 pounds. Albi Miraka placed 3rd at heavyweight. 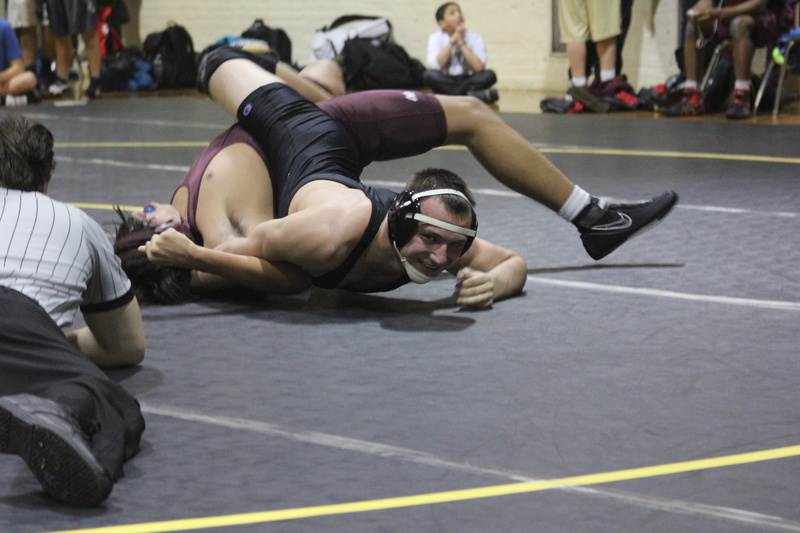 In dual meets, the Knights started of the second half of their season with wins over local teams Lincoln and FDR. The team is now 5-0 in their division, and 7-2 overall. Two Golden Knights earned the privilege to represent NYC Wrestling at the Eastern States Classic over the past weekend. This tournament has over 500 wrestlers from eight different states competing, with many matches broadcast live. Alex Troshyn (138) and Albi Miraka (285) earned spots on the team with their 3rd place finishes at the NYC Mayors Cup last month. Alex was selected by Beat the Streets as an alternate at 138 pounds. 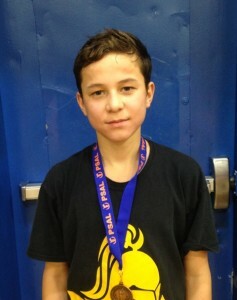 The primary wrestler was David Nemirovsky from Midwood, who placed 2nd at the Mayors Cup. The two Bedford Brawlers would met in the consolation bracket, with Alex coming out on top in a close decision, 3-1. Alex has 16 wins on the season, and has his eyes firmly set on taking 1st at the Brooklyn Tech Open Tournament on January 17th. 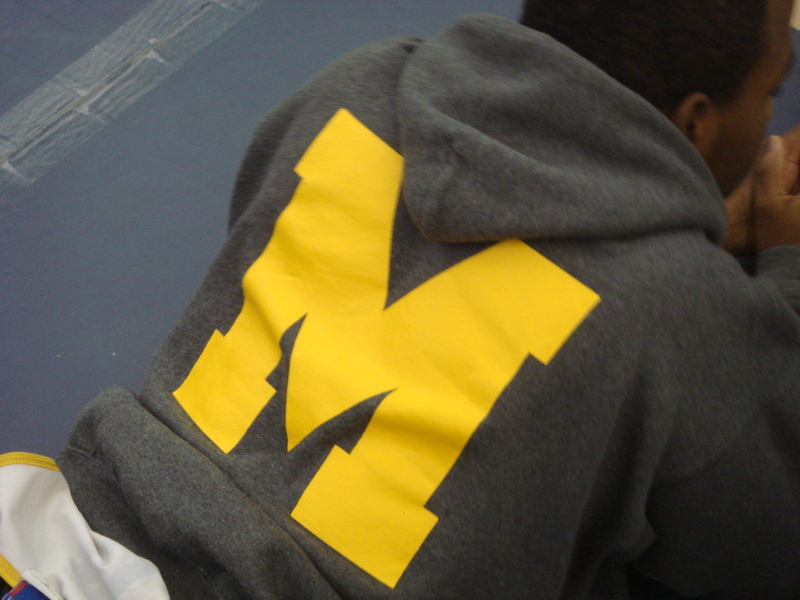 Staying busy in Brooklyn, 16 Madison wrestlers competed at the Edgar R. Murrow Wrestling Tournament. Taking 1st place for the Knights were Umarbek Rakhmatov (99), Mirlan Jumabaev (170), Antonio Sanchez (195), and George Grigalashvili (220). Howard Wang (138) placed 2nd, and earning 3rd place in the consolation bracket were Corey Feliciano (120), Nikita Ignatenko (132), Angel Tapia (152), and just coming up short in the 3rd place bout was freshman Temur Yakhshilikov (145). 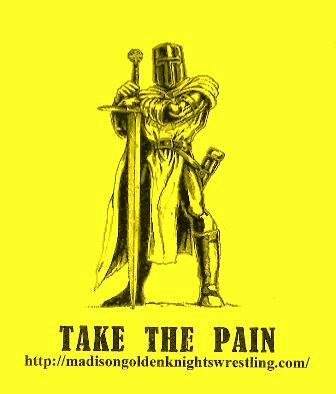 Next up for the Madison Golden Knights Wrestlers is Goldstein and Sheepshead Bay, both divisional opponents, and then the Brooklyn Tech Open Wrestling Tournament on Saturday the 17th. The 30th Annual Dave Ironman Invitational Wrestling Tournament will take place at Monsignor Farrell High School on Saturday, January 3rd. Many excellent teams will be represented, such as Columbia High School (Section 2), St. Benedicts Prep (New Jersey), St. Joseph By The Sea, along with Poly Prep and the host school, Monsignor Farrell, who will no doubt be looking to avenge their team loss to Poly Prep at the NYC Mayors Cup last month. Leading the way for the Golden Knights, and looking to improve upon their 3rd and 5th place finishes at the Mayors Cup in December, are Albi Miraka (Jr.) at 285 lbs and Antonio Sanchez (Jr.) at 220 lbs. Also looking for a big day will be Brandon Santiago, (Jr.) at 126 pounds. Brandon is undefeated this season, and is looking to keep that perfect record intact at Ironman. Also looking to come up big for Madison this year will be Howard Wang (Jr.) at 138 pounds, Angel Tapia (Jr.) at 160 pounds, and Mirlan Jumabaev (Sr.) at 170 pounds. Jumabaev is off to a hot start with a 7-0 record so far this season. 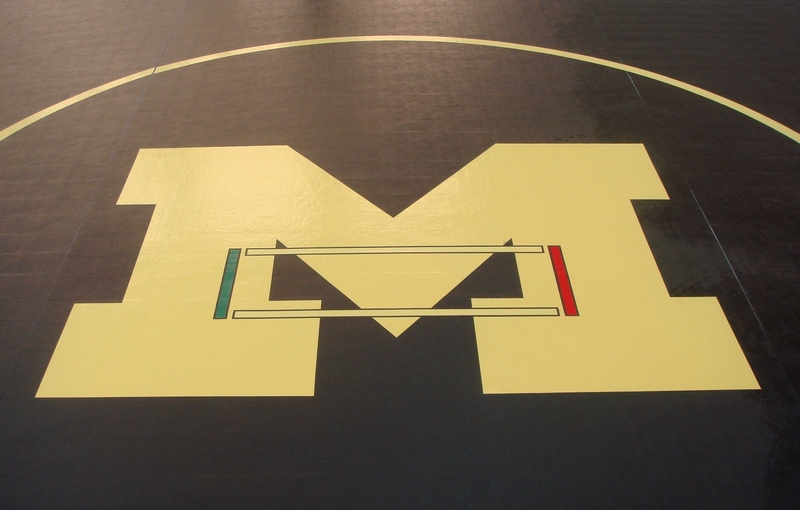 Also rounding out the line up for Madison Wrestling are Corey Feliciano (Jr.) at 120 pounds, freshman Temur Yakhshilikov at 145 pounds, and sophomore Steven Phelan at 132 pounds. The Dave Ironman Wrestling Tournament is historically the most challenging tournament in New York City. To wrestle well at Ironman you must be a very tough and highly skilled wrestler. Madison hopes to demonstrate their toughness and skill, and start the new year off with a strong performance on the mats, at Ironman. Madison Wrestling looks to improve upon their overall record of 5-2 in dual meets when they travel to Lincoln on Tuesday, January 6th for a 5 PM contest. The next day, Madison will host FDR, before participating in the Edward R. Murrow Wrestling Tournament on Saturday, January 10th. The first Madison mat session of the fall club is Tuesday, September 16th. The Madison High School Wrestling Club is a USA Wrestling charted club, with USA Wrestling certified coaches. All Madison wrestlers will have their individual USA Wrestling membership paid for by the program. This is a full membership, good for an entire year. There are also practices every Monday and Thursday, 6 – 8 PM and Saturday, 1 – 3 PM, at Beat the Streets. Beat the Streets is located in Manhattan at 145 Thompson Street, just south of Houston. You will need a completed BTS Parent Authorization Form when you show up for the first time. 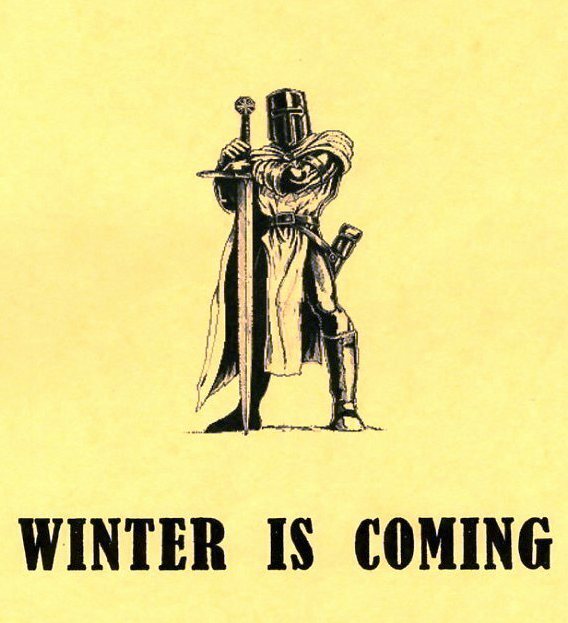 IN SEASON practices start on November 1st. We practice every school day and Saturday in November. Competitions start in December. All new wrestlers will need a pair of wrestling shoes. It is not necessary to spend a lot of money, there are many decent shoes available that are far less expensive than the sneakers you are probably wearing. All new wrestlers will need headgear. This is to prevent cauliflower ear, and headgear is mandatory for all matches during the season. Sharing headgear with another wrestler is not an option. Hygiene is important. September 21st, the Steeplechase Individual Tournament at Petrides, Staten Island. October 26th, the NYC Pre-Season Duals at Cardozo High School, Queens. November 1st, the Easton Elite Duals in Easton Pennsylvania. 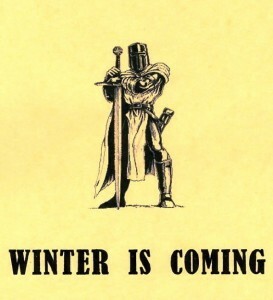 Summer is upon us, and that means the pre-season preparation for next winter has begun in earnest. Through the generous support of Beat the Streets, nine Madison wrestlers will attend one or more wrestling camps this summer, and will be able to get in work on the mats at locations in Brooklyn and Manhattan. Seven first time campers will attend the Beat the Streets Top of the Podium Camp, a comprehensive camp that involves wrestling, life skills, and recreation. Once successfully completed, the wrestlers will be eligible to attend a technique camp located on a college campus. Beat The Streets covers the full camp tuition, and provides transportation. 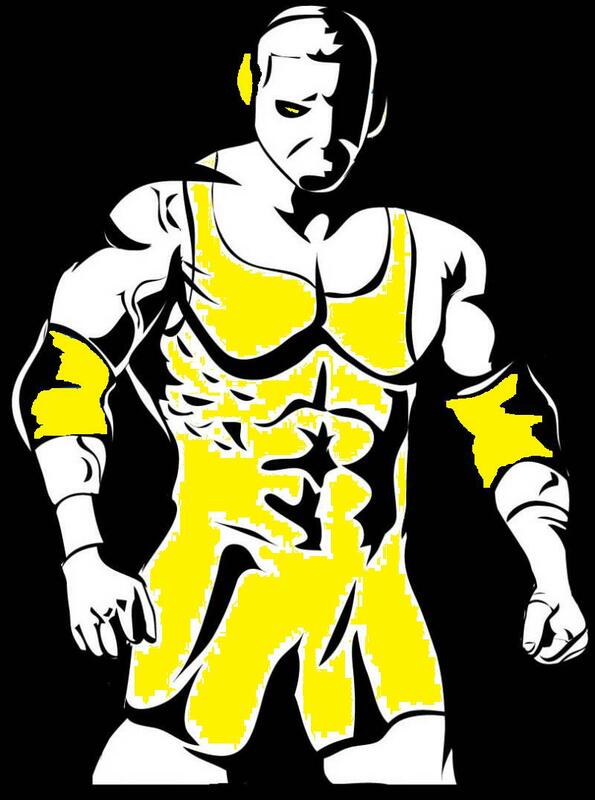 In addition to wrestling camps, the Beat the Streets Manhattan Training Center (MTC) will have high school wrestling sessions starting July 7th to the end of the month, Monday thru Thursday, 9 – 12 noon. In addition, free breakfast will be served at the Manhattan Training Center, Monday thru Thursday at 8:30am, and free lunch will be served after the session. 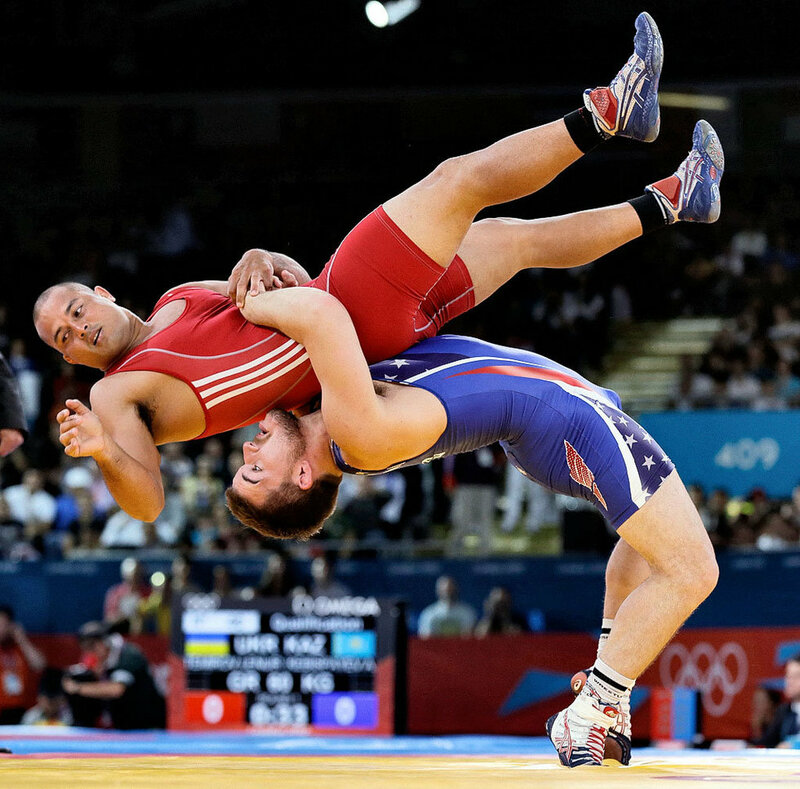 There are opportunities to wrestle at other Brooklyn high schools as well. Brooklyn Tech will have their wrestling room open on Tuesdays and Thursdays, 5:30 – 7 PM, and Grand Street Campus will run sessions on Mondays and Wednesdays, 4:30 – 7 PM. In August the wrestling schedule changes. Grand Street Campus will run Monday thru Thursday, 9 – 12 noon, and Brooklyn Tech will be Monday thru Thursday, 4:30 – 7 PM. 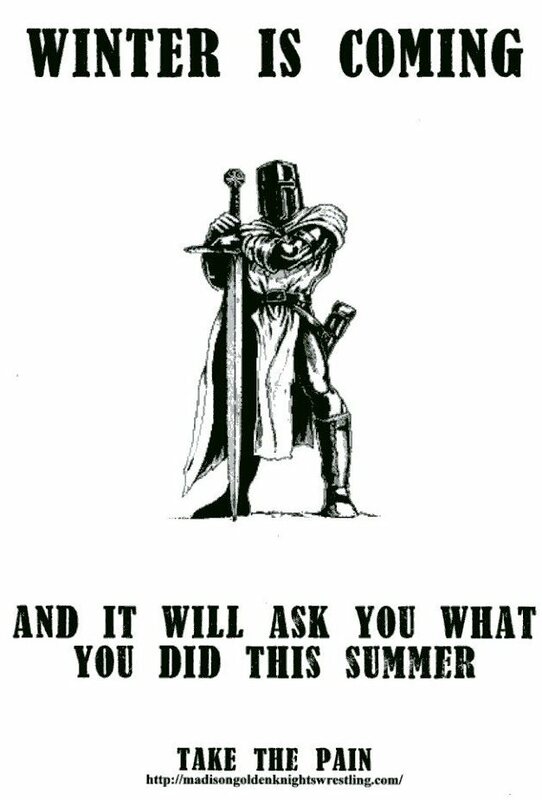 For the dedicated wrestler, who wants to do all they can *to be all they can be* this upcoming season, there are two great mat sessions a day, Monday thru Thursday, all summer! That, along with the camps, makes for an unbelievable summer of wrestling. As the winter season of folk style wrestling comes to an end, the dedicated wrestler beings to look forward to “fiving” his opponents over the spring season. 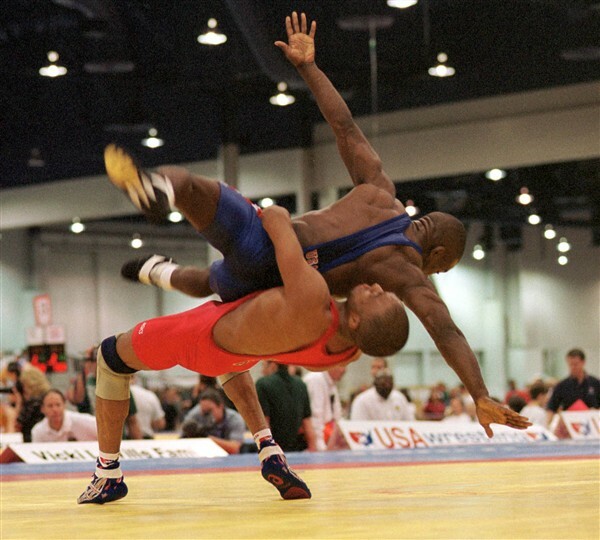 During the spring season, there are many opportunities for the year round wrestler to train in the art of freestyle. With the support of Beat the Streets, there are numerous Neighborhood Training Centers, and of course, there is the Manhattan Training Center with practices four days a week. Neighborhood Training Centers are up and running at Grand Street Campus and James Madison in Brooklyn, Grover Cleveland in Queens, Eagle Academy in the Bronx, and Tottenville on Staten Island. Throughout the spring, there are also many chances to compete. Wednesday, March 26th, April 2nd, and 9th at the Manhattan Training Center, 145 Thompson Street, between Houston and Prince. 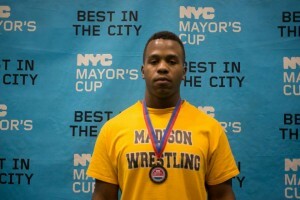 Madison wrestling ended another successful season with a 23-7 overall record, and placing in the top 10 at both the NYC Mayors Cup, and PSAL Championships, with numerous Madison wrestlers placing in both tournaments. At the NYC Mayors Cup, where all of the city’s wrestling teams, private, Catholic, and public, come to compete, Madison placed 8th as a team with four place finishers. Earning spots on the podium were Marc D’Chiutiis, Javaughn Grant, Anand Munkhjargal, and Konstantin Parfiryev, who won his second Mayors Cup title. The season’s culminating tournament, the PSAL Individual Championships and State Qualifier, took place at Truman High School. Wrestlers from fifty PSAL wrestling teams made the trip to compete for the right to be a City Champion and earn a spot on the State team. The team placed 6th overall, with five place finishers. Freshman standout Alex Troshyn wrestled the maximum five matches, and took 5th place at 126 pounds. Alex finished the season with 29 wins, a tremendous accomplishment, and will no doubt be a big part of Madison’s wrestling fortunes next season. Senior Marc D’Chiutiis, who placed 5th, earned his 100th career win at the tournament. Marc is only the second Madison wrestler to achieve membership in the “100 Win” Club. Senior Javaughn Grant, persevering through a shoulder injury, earned a 3rd place finish with a reversal scored in the 2nd overtime with only 1 second remaining on the clock. A great example of never giving up, and taking the pain, Javaughn’s performance exemplified what Madison wrestling is all about. Sophomore Brandon Santiago, having a breakout season, sailed to the finals before falling to Senior Danny Amancio from MLK. Brandon’s 2nd place finish capped off a 25 win season, and set the stage for future successes and championships. Finally, Senior Konstantin Parfiryev plowed his way through the competition, and earned his second consecutive undefeated PSAL Championship. Madison wrestling will be back to work in mid March, with the USA Wrestling chartered club back in session twice a week. Along with the opportunities to put in some quality work at the Beat the Streets Manhattan Training Center, look for Madison wrestlers to do well at NY Freestyle-Greco States in May. Four years together: Konstantin, Coach Campbell, Marc and Javaughn. As for next season, it will be tough to replace the losses of Marc D’Chiutiis, Javaughn Grant, and Konstantin Parfiryev who combined for 105 wins this season. But, with twelve returning starters to the lineup, including standouts Brandon Santiago, Alex Troshyn, and Anand Munkhjargal, along with Mirlan Jumabaev, Alex Vidyaev, and Nikita Ignatenko, plus freshmen and sophomore championship placewinners Thomas Tatesure (1st frosh 160), Angel Tapia and Howie Wang (soph 126 and 152 respectively), the future looks bright.